Sam Holbrook & Alan Porter are 2016's Noteworthy Umpires of the Year [2015: M Carlson & Porter]. Voting (Top 5): Holbrook (12%), Porter (10%), Brian Knight/Paul Emmel (8%), Tripp Gibson (7%). Sam Holbrook and Alan Porter are the Umpire Ejection Fantasy League's 2016 Noteworthy Umpires of the Year, which is Porter's second consecutive time receiving this award, and Holbrook's first. Having returned to the field after bereavement in 2014, Holbrook finished 2016 with two ejections, both of Pirates Manager Clint Hurdle (July 3 and July 20) and was selected to the American League Division Series and the 2016 World Series crews, his first Fall Classic since 2010, which included a Game 7 World Series plate assignment, signifying baseball's confidence in Holbrook's plate work according to several commenters. His return to deep October (and early November) was also seen as vindication for two feats of history: the 2000 mass resignation incident, as well as Holbrook's ejection of Mark McGwire during Big Mac's historic home run chase. Holbrook placed 20th in the League in Replay Review percentage (.600 RAP), but was tied for 10th numerically with only six overturned calls. Holbrook is the No. 2 on veteran Gerry Davis' crew, meaning he could be someone to watch as MLB considers crew chief promotions in the future. 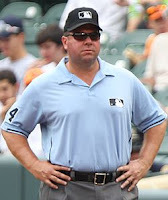 When Alan Porter won this very award in 2015, he was said to "represent the 'new guard' of MLB umpires, taking care of business every game." In 2016, Porter's four ejections drew further praise for situation handling, as did his crew chief, Jeff Kellogg, who also placed in the Top 5 for 2016's Honorable Umpires. Porter finished seventh in the League in Replay Review (.667 RAP), and just as he did in 2015, Porter drew a postseason assignment in the 2016 Division Series, where he called the second-highest plate of his NLDS. Porter also promoted from fourth to the number three spot on Kellogg's crew, as John Tumpane joined the big league staff. Sam Holbrook now has 21 points in the Umpire Ejection Fantasy League (18 Prev + 3 Award = 21). 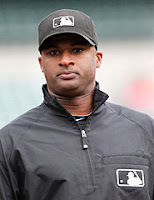 Alan Porter now has 23 points in the Umpire Ejection Fantasy League (20 Previous + 3 Award = 23). The next postseason award, Ejection of the Year, will be released tomorrow.